Starting a business in itself is a risky endeavor. But starting a business straight out of college is daunting—and an ingredient of most success stories. When information management system graduates Claire Ongcangco and Miko Cornejo accepted their first project in 2007, it was mainly for the extra dough they could get. “It was for fun at first. We had additional money to buy things we wanted,” Ongcangco said. The Ateneo de Manila University graduates worked on at least five projects before Ongcangco graduated in 2009. Back then, websites only had a starting price of Php 10,000 while database systems start at Php 50,000. “When we were students, as much as it was for fun, we knew there was something at stake if we failed,” Ongcangco said. The duo did everything themselves. Ongcangco was tasked for the design and marketing while Cornejo tackled all the programming. Concept Machine (CM) was not even a concept then, as the duo was only known as Claire and Miko, the go-to students for website needs. The added task meant sleepless nights wherever: from their own couches to nearby cafes. After gaining traction, they have scored clients within the ADMU community, prompting the two to ask themselves: Are we serious about this? But the sound differs on the other side, with Cornejo at first hesitant about doing things on his own. “Starting my own business sounded risky to me. It meant no back-up plans if something failed. I was always wired to apply for a corporate company after graduation but here I am,” said the CM co-founder. The jump proved to be worth it. INDUSTRY LEADER. 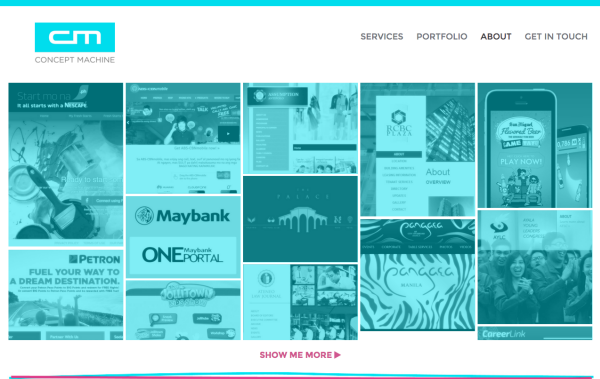 A screenshot of CM's portfolio which consists of at least 50 websites for different companies, including San Migel Corporation, ABS-CBN and Yuchengco Group of Companies. CM has now built the websites for Yuchengco Group of Companies, ABS-CBN, San Miguel Corporation and some restaurant and bar groups to name a few, growing their portfolio to at least 50 websites. The two have also tapped the help of three other programmers so they could accept more projects. If then they only had one to two clients a month, the company now has a steady stream of projects of 15 to 20 in a year. Ballpark figure of their website these days? A hundred thousand, and that’s only the most basic one. Yet even with these successes, the company never even had their own website or Facebook page until early this year. “Most of our clients were referrals. The marketing for us, I guess, is word of mouth. Do your work well and it will speak for itself,” Cornejo said. One thing Ongcangco has also come to nurture in their line of work is the value of network. The co-founder said she can sometimes track how a client got to their door through mutual friends. “It matters to do good business with anyone since that can easily spread in the industry. You always have to be true to your word especially with clients,” she said. It may sound all good and done but the two not always had the best of days. The company sometimes fail to acquire a client and get rejected in project biddings. During their earlier days, the two did not have anyone but themselves to finish projects. The success gets overwhelming to both of them, especially to Ongcangco who had juggled entrepreneurship, law school and serving as a lecturer in ADMU for the last four years. “I think it all comes with prioritization and having [a] reliable partner. You have to complement one another, and ultimately compromise to each other’s needs,” Ongcangco said. The accidental entrepreneur between the two, Cornejo has also realized how their business has somehow molded both of them to grow and shift mindsets, from merely getting work done to visualizing what’s next.